We’d love your help. Let us know what’s wrong with this preview of Murder in the Choir by Ruth Shidlo. The investigation takes DI Mirkin behind the scenes, to the mercur In this second Helen Mirkin novel, upon her return to Tel Aviv, Detective Inspector Helen Mirkin is tasked with finding opera singer Araceli Pena, who uncharacteristically has missed two Wozzeck rehearsals before opening night. When she is found dead in bed, the circumstances of her death are far from clear. To ask other readers questions about Murder in the Choir, please sign up. When I came across this title, my first reaction was. “Who got murdered? The Soprano or the music?”… The second D I Mirkin novel is set against the choral music scene in Tel Aviv - a scene Shidlo is familiar with (as am I, which is why I chose to read and review this book). A very talented opera singer on the verge of a major career break is found dead in suspicious circumstances. Was it accident? Did she commit suicide? Or was she murdered? As the investigation progresses, the list of suspects When I came across this title, my first reaction was. “Who got murdered? The Soprano or the music?”… The second D I Mirkin novel is set against the choral music scene in Tel Aviv - a scene Shidlo is familiar with (as am I, which is why I chose to read and review this book). A very talented opera singer on the verge of a major career break is found dead in suspicious circumstances. Was it accident? Did she commit suicide? Or was she murdered? As the investigation progresses, the list of suspects grows longer, including fellow participants of the prestigious Opera workshop, egocentric directors and rich benefactors. Who wanted Araceli Pena dead, and why? 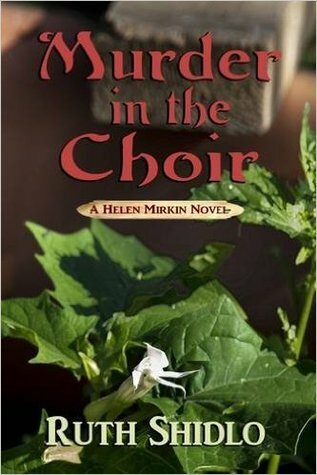 D I Helen Mirkin tries to juggle between her personal life as a gay woman, her love for music and choir singing, and her career as a police officer in order to solve the mystery before another body turns up. I enjoyed reading the book. Looking forward to No. 3. I was drawn into the story from the beginning, and found it hard to put down. I wanted to learn more about the various characters and what makes them tick, and I loved the setting in the musical world. This is the second book I've read by this exciting new Israeli author, and I look forward to DI Mirkin's next case. I am also curious about her relationship with Mira, and where it will go. Born in Portugal, Ruth Shidlo has also lived in Spain, Israel, and the United States. She practices as a psychologist in Tel Aviv, and is the author of the Helen Mirkin series. Her books are available via Amazon and other online sellers.